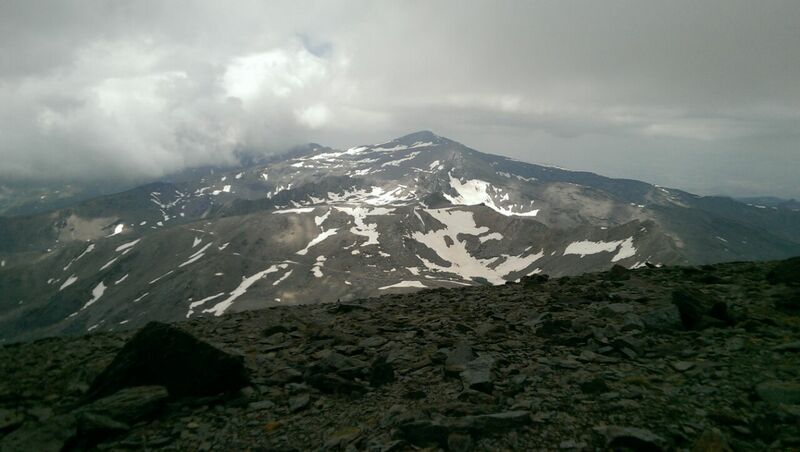 Even the Mulhacén isn`t very well known and definitely not famous, we were eager to learn more about the Spanish mountains and vegetation. Some people who have their own idea of the european peaks call it actually one of the Seven European Summits.. Many people do it in two or more days and stay at a hut one night, but as we were short on time during this trip, we decided to do it in one day. This means to cover more than 30km and around 2000 height meters in both ascent and descent! We stayed in a lovely nice hotel in a village calles Capileira in the Sierra Nevada Mountain Range about a one hour drive from the starting point of the hike. As the Sierra Nevada is mainly popular for skiing and wintersports, it was completely off-season and we were almost the only people in the village. We got up at around 5:30 a.m. and there were only two cars in the parking lot when we arrived. The first two hours are a leisure, more flat than steep hike through beautiful forests and meadows. Once we passed a couple of other hikers, we reached the Refugio Poqueira, a hut that was closed this time of the year, and had a short break accompanied by a couple of capricorns. From the hut there were different options to proceed and we choose, whatelse, the “wrong” one… It eventually lead us to the summit, but it crossed a snow-covered ridge plenty of times, whereby we needed much longer than expected and got soaked wet almost entirely. The weather was perfect the first few hours with no clouds and the sun burning, so we were able to walk long parts in shirts. But the closer we got to the summit and therefore to noon, the more windy and cloudy it became. Nici, a good friend who joined us, really suffered from the height and Maggy obviously was exhausted as she (once more) hadn`t eaten enough fur such a long and strenuous hike. We reached the summit at around 2 p.m. and almost the whole foresight was gone. Big clouds blocked the view and we got cold quickly. As there was no need to remain on the top any longer, we started descending almost immediately after we took some pictures. The descent was awful. With the clouds and wind the fog was coming and we almost lost our way three times. We had to cover 2000 height meters and once more got remembered why you should carry hiking poles with you on such long tours… We teamed up wit a lonely moroccan hiker who had no clue where to go and finally made it back to the car in around 8 hours in total. From there we drove straight to the coastline for some relaxing and sunbathing. Enough food and water, good shoes and -for gods sake- the poles will get you through any mountaineering thing! Keep exploring!! !